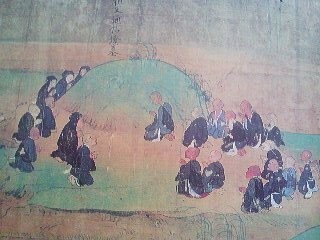 The wandering priest Ippen, founder of the Ji Sect, leads his followers in an ecstatic Odori Nenbutsu Dance (a detail from the 13th century painted scroll the Ippen Shonin E-den). If you ask a Japanese, whether friend, acquaintance or complete stranger, what their religion is, they will most probably respond by saying: I have no religion ! This might seem like a strange answer, especially from someone that you KNOW has a Buddhist or Shinto altar (or most probabaly both!) in their homes, or from someone that you might actually see praying at a a temple or shrine. The problem lies with the wording of the question. For most contemporary Japanese the word SHU-KYO- (宗教), which is the translation of the English word religion, has negative connotations- suggesting something like a cult, and certainly something which drives people to war and murder (or being brainwashed). But the fact is that most Japanese ARE religious! In my opinion much more so than contemporary Europeans. If someone asked ME what religion most Japanese people were I would answer: Japanese Religion- which is a combination of Buddhism and native Japanese beliefs and practices called Shinto which play an important part in the lives of most Japanese. What I am trying to say is that the rituals, customs and beliefs that many non-Japanese would think of as religion- the Japanese look upon as just being a natural part of being Japanese- and not something which should be referred to as Shu-kyo- (宗教). It is even true that most Japanese that you meet (or their parents or grandparent, at least) are officially affilliated with a Buddhist temple (the one million Japanese Christians and a small number of pure Shintoists are an exception). In fact, for most of the Edo Period (1600-1868) every Japanese family was required to be connected with a Buddhist temple- to attest to the fact that they were not Christians- which was illegal under penalty of death. 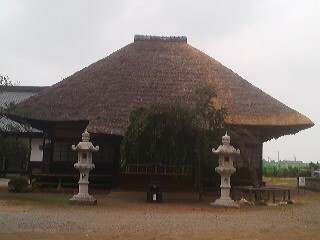 The members of a particular temple are called that temple`s DANKA (檀家). I ask: what kind of Buddhist temple is your family connected with? : Anata ga DANKA no O-tera wa nani shu desu ka? Or if I am talking to a local resident of Tsukuba (whose family has lived here for generations) I will simply ask: Doko no O-tera no DANKA desu ka (どこのお寺の檀家ですか？)- Which temple are you a DANKA of ?- since I am familiar with most of the temples in this area and know what sects they are affiliated with. Sects? Yes, there are many of them in Japan (more than 10). And there are even different factions within the sects. Most westerners with an interest in Japan, probably come here believing that most Japanese are Zen Buddhists (because of the popularity of certain books and films). And though Zen has had in incalculable impact on traditional Japanese culture, especially in the arts, it is surprising (and disappointing) for many foreigners to find that very, very few Japanese know anything at all about zen- even those whose are DANKA of zen temples! Indeed, it is extremely rare to find the DANKA of ANY sect who knows much about theology. Each sect does, however, have different customs and traditions which are still practiced by DANKA. So if you know what sect a person belongs to you can gain an understanding of his/her family`s religious practices. 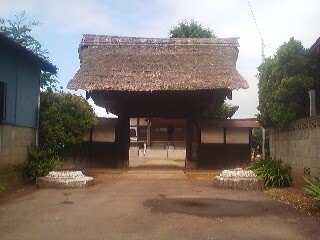 Ippen`s birth house in Iyo Province (what is now Ehime Prefecture)on the island of Shikoku. Near the famous Dogo Hot Spring. The Buddhist sects with the largest number of DANKA on a nationwide scale are the JODO SHINSHU (founded by Shinran. 1173-1263) and the JODO SHU (founded by Honen. 1133-1212), which were taken up with enthusiasm by the common people who appreciated the message that anyone- rich or poor, man or woman, could be saved through faith in the Amida Buddha- and by chanting a simple mantra- Namu Amida Butsu- as much as possible. Coming to Tsukuba, I was surprised to find that even though the charismatic priest Shinran, the founder of the Jodo Shinshu, Japan`s largest Buddhist sect, lived for many years near Tsukuba (in Shimotsuma and Kasama) and had a huge impact on this region, there are very few Jodo Shinshu temples in the eastern and northern parts of Tsukuba- instead most belong to the Shingon Sect of esoteric Buddhism which was founded by the great priest Kukai in the 10th century. In fact it might be because of this deity- whose name means the Unshakeable One- that Shingon is so prominent in this area. Shingon was promoted by the Imperial Court and by the powerful Fujiwara Family as a way of spiritually calming this region after the Rebellion of Taira no Masakado in the 10th century. 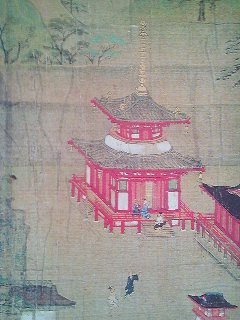 In later years, when Tsukuba was located to the north-east (the unlucky direction) of Edo Castle, these temples were also important fpr rituals held to keep the calm in the realm ( during the Edo Period what is now the Mt. Tsukuba Shrine was a huge Shingon-Sect Temple Complex). Besides Shingon Buddhism, I was surprised to find ANOTHER sect of Buddhism relatively prevalent in Tsukuba. A sect which most Japanese you ask will never even have heard of never heard of. 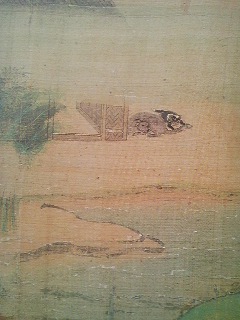 It is the Ji-Shu (時宗). In fact, whenever, I meet someone who says they are from Shimana, Tsukuba, I say: Oh, is your family Ji-Shu? And they are usually amazed that I should know. The reason I do, is that there is an old ( and beautiful) thatched-roof Ji Shu Temple in Shimana- which once buried deep in the woods is now soon to be surrounded by a housing community and is visible from the Banpaku Kinen Koen Station on the TX Line ( the right side when headed towards Tokyo). Most of the old residents of that area of DANKA of that temple. 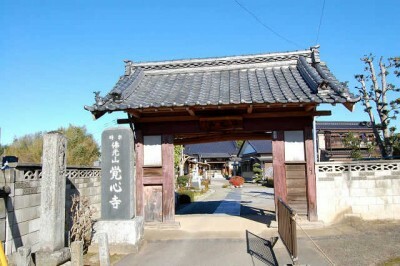 There are also Ji-Sect Temples in Hojo (Muryo-In) and Tamatori (Saiho-Ji). There are also Ji-Shu Temples in Konda, Anyo-Ji ( which was used as a school after the Meiji Restoration of 1868 until a proper elementary school was built), and Shosai-Ji in Tegomaro. 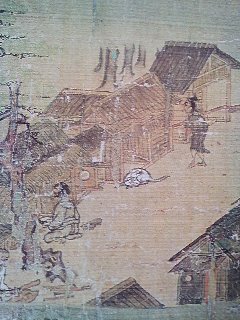 So it is not rare that when I ask people in Tsukuba what Temple they belong to I find that they and their ancestors have been connected to Ji-Shu. I also detect that more than the DANKA of most other temples, these people are proud of their association with this obscure branch of Buddhism. The fact is though, that as with the other sects, most DANKA of JI-SECT temples do not know much about theology. And even more unfortunately, the unique characteristics historically connected with Ji-Shu have also been almost completely lost. And just what are these characteristics? The Ji-Shu is recognized as having begun in 1274. It was in that year, that after having made pilgrimages to the Shitenno-Ji Temple in Osaka (supposedly founded by Prince Shotoku and deeply connected woth the Jodo Faith) and Mt. Koya ( one of the most important Shingon Temples) Ippen, arrived at the Kumano Shrine. There he had an experience which changed his life. Encountering someone whom he took to be the deity of the shrine (the Kumano Gongen) as well as a manifestation of the Amida Buddha, he came to understand that Amida had made a vow to save humanity and assist them in being reborn in the Jodo Paradise- and that this did not depend on chanting the name of Amida (as taught by Honen of thr Jodo Sect) or by true faith in Amida (as taught by Shinran of the Jodo Shin Sect). Anyone could be save whether they chanted or didn`t chant, believed or didn`t believe. Just being handed a paper talisman (O-Fuda) with Amida`s name on it would be enough to earn someone salvation. 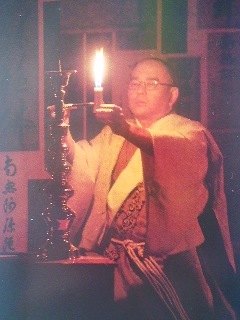 After this experience Ippen took on the name Ippen (he had used different names up to that point), abandoned his wife and daughter (who had apparently been with him on his pilgrimage), and began a life of ceaseless wandering around Japan, chanting the name of Amida and distributing talismans to everyone he met. He picked up devoted followers on the way. 1) The distribution of paper talismans on which the Nembutsu (the name of Amida)- NAMU AMIDA BUTSU was written, along with the enigmatic phrase-.Ketsujo- O-Jo- Rokuju-mannin, which probably can be translated as something like- It has been decided that 600,000( the population of Japan at that time?) shall be reborn in the Jodo Paradise. 2)These were distributed to everyone encountered in the belief that they would aid anyone who received one, believer or non-believer, in attaining salvation by being reborn in the Pure Land Western Paradise. 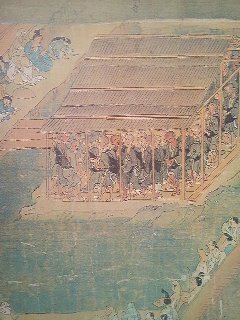 3) Ippen and his followers (all mendicant travellers- wandering holymen) drew large crowds wherever they went because they would perform ecstatic dances- while being drums and chanting Nembutsu. This was called Nembutsu Odori- which many say is the source of todays Bon Odori Dancing held throughout Japan in mid-August. They were expression of joy at the knowledge that one would be reborn in Paradise. 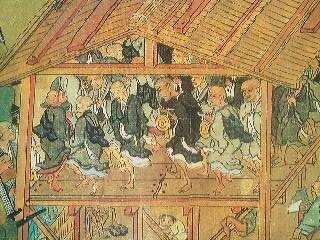 4) Of all the Buddhist sects, the Ji-Shi was probably most deeply intertwined with the native Shinto Deities. In fact, Ippen`s most defining religious experience came at the Kumano Grand Shrine after encountering what he believed was the deity of the shrine. Besides the fact that a toned down version nembutsi dancing can be seen twice a year, in autumn and spring, at the Ji-Shu`s main Temple- Sho-jo-ko-Ji * (清淨光寺)in Fujisawa,Kanagawa Prefecture, none of these original features survive as a part of the lives of the DANKA of Ji-Shu Temples.Because of this, I might go as far as to say that belonging to a Ji-Sect temple today is probably the least interesting of any sect in Tsukuba. In Tsukuba`s Ji-Sect temples, there are no special rituals, sermons, or festivals.Danka pay their annual dues for the upkeep of graves and maintenance and memorial services are held for ancestors and deceased family members. 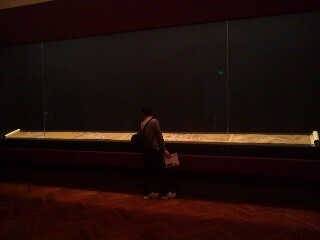 First, the Nembutsu dancing of past ages was apparently not merely ecstatic- but downright bawdy. Some scholars suggest that this type of dancing originated with coupling festivals called KAGAI (which was held twice a year on Mt. Tsukuba) and then after its popularization by Ippen even gave birth to what is now known as Kabuki Theater. After the Meiji Revolution of 1868, under puritanical western pressure, such LUDE behaviour (by the European standards of that time) was discouraged or outright banned. 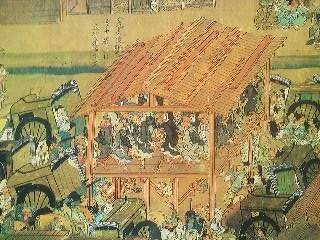 And since during the early part of the Meiji Period (the 1870`s) certain fanatics tried to violently separate what they judged to be FOREIGN Buddhism from NATIVE Shinto, the Ji-Sect , which more than any other of the Pureland Sects made use of Shinto deities, was a perfect target for suppression. The Ji-Sect had to lay low. And that`s how these temples remain today quiet and unassuming. 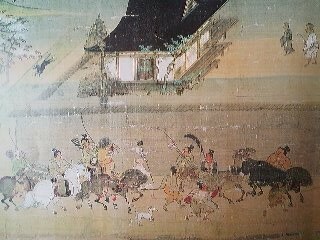 That makes it surprisng to read that from the 13th to the 15th centuries Ji-Shu was one of the most important, maybe THE most important Pureland Sect- especially popualar among warriors for whom it provided convenient battlefield funerals and recourse to prayers to popular Shinto Deities. Ippen`s defining moment- an encounter with what he believed to be the Kumano Gongen- a manifestation of Amitaba Buddha, who encouraged Ippen to distribute paper talismans to everyone he met, whether they had faith or not. This experience happened in the mountains near the Kumano Shrine in Wakayama Prefecture. As you can tell, I find the history of the Ji-Shu- as oppossed to its present state- quite exciting. I even feel a strange connection with it since I once had avery strange Ji-Shu related experience. Once I was waiting to be picked up for a job that I had. I was accustomed to being picked up by the same person, every week, over a period of several years/ On that day, however, I got into the car and there was a stranger in the drivers seat. The usual person was busy that day, and he had come as a replacement to take me to the class. I still can`t imagine why, but for the whole 30 minute drive I was talking- quite rapidly, about the history of Ji-Shu, and about Myotoku Ji, the Ji-Shu Temple in Shimana Tsukuba. I had NEVER spoken with anyone, ley alone a complete stranger, about these topics. The driver, said nothing as I continued to rant away about the history of the sect and that particular. In fact, he looked quite agitated- even disturbed by my rambling. Finally, when we reached our destination, he faced me and said: To tell the truth, I live at the Myo-toku Ji Temple. My father is the priest! Ippen giving one of his paper talismans to wealthy man. Notice the hawk (top right) and the party (complete with prostitutes) going on in the house. 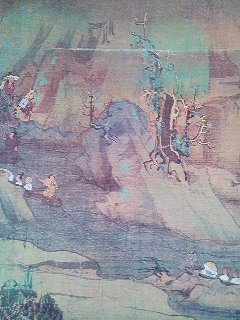 That is why when I found out that the Ji-Shu`s greatest treasure (and a National Treasure of Japan)- the Ippen Shonin Eden Picture Scroll would be on display at the National Museum I knew I would have to go. I am very familiar with that AMAZING art work because I have a book, a very large one, which contains the COMPLETE work. I have spent many hours examining the details of this work, trying to get a sense of what life was like in Japan 700 years ago. Unfortunately, when I got to the exhibition, held in the special National Treasure Room at the museum, I could not help but be disappointed. The details of the scroll were difficult to see behind glass and at a distance- and even more importantly- only one relatively small segment of the scroll is shown. So while it was nice to bask in the energies of the original work- it just was not as rewarding as sitting down with the book and examing the smallest details at my leisure. Let me sum up the story of Ippen`s life- which is basically the same story illustrated by the scroll. In 1239 Ippen was born to a prominent family in Iyo Province (now Ehime Prefecture on the island of Shikoku) near the famous Dogo Onsen Hot Springs. His original name was Matsujumaru (松寿丸). In 1248, when he was 10, Ippen`s mother passed away. 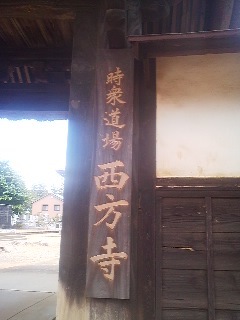 He went off to a temple to be a Buddhist novice and took on the name Zuien (隨縁). 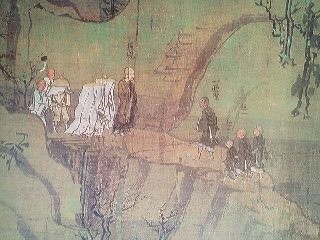 In 1251, Ippen went to the Dazaifu on the island of Kyushu to study with the priests Shotatsu and Kedai. He name was changed to Chishin. 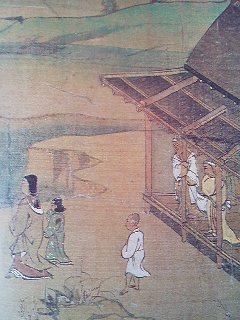 In 1263, Ippen heard news that his father had passed on and returned to Iyo Province where he married with the intention of keeping up the family estate. In 1267, he left home once again for the religious life ( though probably with his wife and daughter). 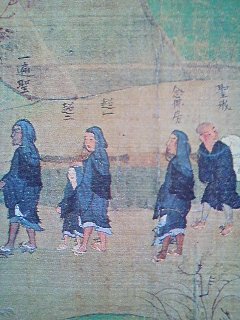 In 1271, at the age of 33, Ippen first made a pilgrimage to the Zenko-Ji Temple (in what is now Nagano Prefecture) and then went back to Iyo Province and cloistered himself at the Kubodera Temple. In 1273, at the age of 35, he underwent asceticisms at a remote mountain retreat in Iyo Province. 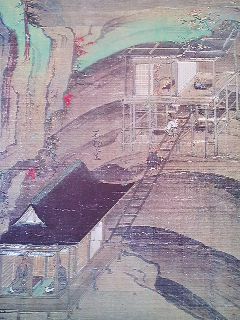 In 1274, Ippen and two others, probably his wife and daughter, set out on a major pligrimage to Shitenno-Ji in Osaka, Mt. Koya, and then the Kumano Shrine. At Kumano, he had a life-changeing religious experience. In 1276, at the time of the Mongol Invasions, Ippen crossed over to the island of Kyushu, and visited a Hachiman Shrine in what is now Kagoshima Prefecture. 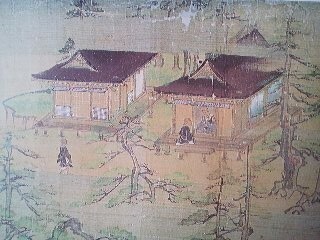 In 1279, Ippen visited the capital and stayed at the Inaba Do Temple. 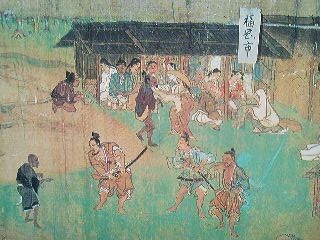 Then in Saku (in what is now Nagano Prefecture) the first Nembutu Dancing sessions were held. In 1280, Ippen travelled to the North-East (Tohoku) Region of Japan and passed through what is now Ibaraki Prefecture. Perhaps this accounts for the relatively large number of Ji-Sect Temples in this prefecture- about 50 out of a nationwide total of 410. In 1282, just after the second attempted Mongol Invasion, unable to enter Kamakura, Ippen stayed at Katase . 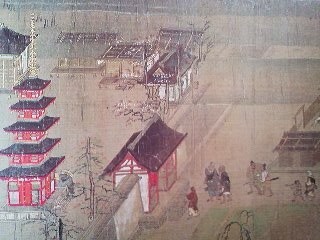 In 1283, Ippen passed through the Tokai Region, Owari and Omi and spent New Year`s at the Seki Dera Temple. 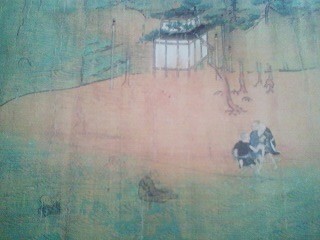 In 1284, Ippen entered Kyoto where he preached and danced Nembutsu. 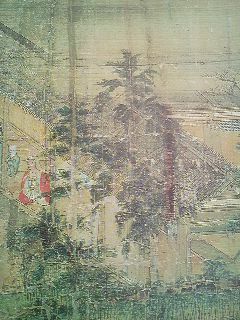 In 1286 he visited, Shitenno-Ji, the Sumiyoshi Shrine, the Taima Dera Temple and the Iwashimizu Hachimangu Shrine. 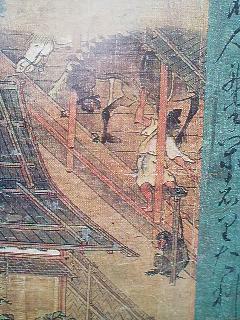 In 1287, at the age of 49, he visited Shoshazan in Harima (now Hyogo Prefecture). In 1288, visited the O-Mishima Shrine in Iyo. 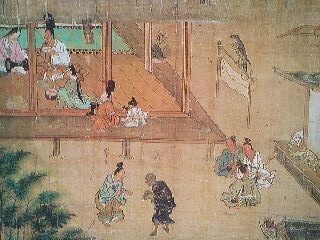 In 1289, after visitng the Zentsu-Ji Temple on the island of Shikoku he fell ill. He than crossed over to what is now Hyogo Prefecture and passed away at The Kannon Do Hall. After Ippens death his disciples established Ji-Sect Temples (possibly in oppossition to what the founder would ahve wanted. 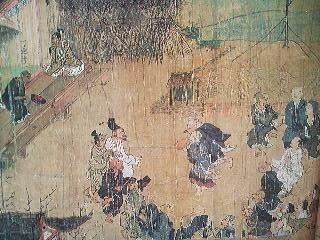 During the Edo Period (1600-1868) there were 12 branches of the sect. These merged into one after WWII. * Sho-jo-ko-ji is more commonly referred to as Yugyo-Ji (遊行寺)- meaning the Temple of the Wandering Holy-men and its abbot called Yugyo-Shonin (遊行上人)- the Wandering Saint – despite the fact that adherents of the Ji-Sect are no longer a band of travelling mendicant who perform ecstatic dances and distribute talismans to anyone they happen to meet. This temple was founded in 1325, in Fujisawa (in today`s Kanagawa Prefecture) by the fourth generation leader of the sect after Ippen`s death, a priest called Donkai (呑海). The complex was burned down once during the Period of Civil War (Sengoku Jidai) in the 16th Century, but was rebuilt in 1607. As oppossed to the Ji-Sect Temples in Tsukuba, Yugyo-Ji maintains a busy calendar of ceremonies and events, many which are distinctive to Ji. The Hitotsubi Ho-yo- (一つ火法要) Single Flame Ceremony held each year on Nov. 27th at the Yugyo-Ji Temple in Fujisawa. The ritual is meant to cleanse one of one year`s worth of sin in preparation for the start of a new year. The entire temple complex is darkened- then the name of Amida is chanted. Finally a new flame is lit illuminating the darkness.